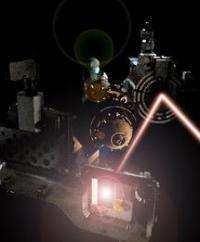 (PhysOrg.com) -- Oxford scientists have created a transparent form of aluminium by bombarding the metal with the world’s most powerful soft X-ray laser. 'Transparent aluminium' previously only existed in science fiction, featuring in the movie Star Trek IV, but the real material is an exotic new state of matter with implications for planetary science and nuclear fusion. The discovery was made possible with the development of a new source of radiation that is ten billion times brighter than any synchrotron in the world (such as the UK’s Diamond Light Source). The FLASH laser, based in Hamburg, Germany, produces extremely brief pulses of soft X-ray light, each of which is more powerful than the output of a power plant that provides electricity to a whole city. The Oxford team, along with their international colleagues, focused all this power down into a spot with a diameter less than a twentieth of the width of a human hair. At such high intensities the aluminium turned transparent. Whilst the invisible effect lasted for only an extremely brief period - an estimated 40 femtoseconds - it demonstrates that such an exotic state of matter can be created using very high power X-ray sources. The researchers believe that the new approach is an ideal way to create and study such exotic states of matter and will lead to further work relevant to areas as diverse as planetary science, astrophysics and nuclear fusion power. A report of the research, 'Turning solid aluminium transparent by intense soft X-ray photoionization', is published in Nature Physics. The research was carried out by an international team led by Oxford University scientists Professor Justin Wark, Dr Bob Nagler, Dr Gianluca Gregori, William Murphy, Sam Vinko and Thomas Whitcher. "nearly invisible to extreme ultraviolet radiation." Is anyone here knowledgeable enough to explain how it is possible to determine that a form of matter is transparent when it only exists for 40 femtoseconds? This is not new. There is a company in the US that has been producing this product for the military for a while. Most radiation detection technology is quick enough, in the order of femtoseconds, to photomultiply and record quanta this small/fast. If a thin enough sheet of aluminium is placed in front of a UV source, the laser bombarding the sheet would render the spot irradiated "transparent" to the source behind it, which they claim isn't opaque anymore to a certain wavelength of UV. A fast detector could absolutely record a 40 femtosecond blip that will hit the detector on the opposing side of the sheet from which the laser is incident on. The UV can be confirmed on a calibrated oscilloscope. However, this is a totally general way to assume how experiment was performed, but the lack of detail in most of these articles creates assumptions like this; common. I hope this technique helps some people on here fill in the assumptions. Any other ideas? A possible use for this is a 40 femtosecond cycle optical transistor that may possibly even conduct electrical information to other components while its cycling/processing information optically. How quickly science fiction becomes science fact. A possible use, someone is already thinking about making it, useful. Is the aluminium decompressed or compressed? What happens when you decompress it? The FLASH laser, based in Hamburg, Germany, produces extremely brief pulses of soft X-ray light, each of which is more powerful than the output of a power plant that provides electricity to a whole city. Now that we have created transparent aluminum that lasts for "no time at all" maybe we should take the power from this INCREDIBLE "Laser" and power a city with the "short flash" instead of creating the illusive invisible metal. What if Scottie was right? What if there is a way to stabilize "invisible" aluminium? computer.... cooooommmmmpuuuuuuuterrrrrrr? Oh a keyboard!! How Quaint! I can't but wonder if this kind of research really is the best way to use energy, money and expertise of the researchers? A whole city worth electricity for 40 femtosecond effect to study a phenomenon that MAYBE could prove useful SOMEDAY, when we could use the energy, money and expertise to improve the quality of life for all people and preserve the environment with the technology that we have available NOW? I don't want to sound ignorant towards this kind of research, it's just that lately I've been wondering is it really necessary right here and right now? iledius and others - This laser cannot power a city, and it doesnt even use a lot of energy. It uses that much power, but only for 40 femtoseconds. I doubt you want to power a city for 40 femtoseconds. Remember, power is different thing than energy. I saw a feature about a company in Mass on the Discovery channel that has this product on the market already. Why is this "breakthrough" any different? Hey everyone I just invented the wheel, come and look! Because it would power the city only for 40 femtoseconds (Power is not equal to Energy). Lasers of this kind are decidedly NOT built for continuous operation. The actual energy used in the experiment is rather small - just like a flash of lightning has a lot of POWER, but not a lot of ENERGY. Example: At 10 million volts and 10000 Amperes and one microsecond duration a flash has only 0.027 kWh of Energy. For comparison: an average citizen uses about 6000kWH of Energy per year. Or for this experiment (assuming a city needs something on the order of 1GW of power): At 40 femtoseconds that would be merely a total ENERGY output of about 10 nanoWattHours. You couldn't light up an LED with the energy provided by this experiment. Listen, I know this doesn't seem like a big deal. However, like most scientific discoveries, it takes a bunch of smaller ones to make a lasting impact. I would challenge all of you nay-sayers out there to take a look at this again in 10 years, and I think that more than likely we will have things already using this discovery. I remember some time ago when people were trying to transfer power wirelessly. Nowadays, it can be done, but just not effectively enough yet. In another few years, I would say it would be mainstream. Every large scientific discovery takes one small discover to start it. Personally, I congratulate them on their accomplishment!! Isn't 'Transparent aluminium' just a fancy name for colourless sapphire? No more than glass is another name for silicon. Sapphire is an oxide of aluminum just like glass is an oxide of silicon. Making a metal transparent is a tad harder than making an oxide transparent. I think it has to do with those electrons wandering around. Is this process destructive? Almost anything will turn transparent briefly as it vapourises. If there is a change of state and modification to electron distribution, is it still a metal? Perhaps it is a saphire momentarily but more likely just a gas! Erm ... maybe the super powerful FLASH laser that is brighter than the light from a whole city actually *burnt a hole* through the really thin aluminium?! I expect we can make sapphires large enough to contain a couple of whales. Like many technological challenges its a matter of time and money. In the case of whales we may not have enough time and does anyone care enough to spend the money. Better to wait a few centuries, borrow a klingon bird of prey, sling shot around the sun to achieve time travel, meet a pretty girl and save the whales all in a few days .. much more fun. I undestand that the energy output of the laser is extremely small. I was making fun of the way the article was written! Come on, this is really not transparent aluminum, and I don't believe they proved this a new state of matter. At best it might be considered an altered state due to the way the radiation "knocked out" an electron. These scientists or the article writer should word the facts in a factual way. While Transpartent aluminum may be possible, this procedure will probably not produce it anytime soon, unless they want to produce continual radiation to keep it transparent. Are there any known transparent metals? Only in very thin films. Careful control of the thickness of the metal coating can block a specific frequency of light. The electronic conditions that make a substance a metal also make it reflect light. This is supposed to be due to some electrons being able to move freely from one atom to another in the metal. I don't find anything wondrous about it. I think they explained it: they saturated the EUV absorption by exciting every appropriate core transition. But it is well known, this core electron ionization will be followed by other lower energy ionizations, which will affect the structure of the aluminum. Yes, in previous FLASH studies they demonstrated diffraction by soft X-ray (EUV) before the dielectric sample exploded as a plasma. The physorg article above does little justice to the actual nature physics article. It's all about the photoionization of aluminum by EUV. It is truly a transient plasma-like ionized condensed state. What is not discussed is how much charge builds up from photoelectrons leaving the surface. After the photoelectron, the second ionization is the Auger electron. One may argue these ionized electrons will have harder time to lose energy to ionized atoms by producing secondary electrons, meaning they travel farther. glass is not simply oxidized silicon. That would be quartz. True. However the point was that silicon is opaque whereas silicon oxide is transparent. Much like aluminum oxide. So is it an actual new state of matter, or just an exotic amalgam of the properties of the 'old' ones? A bit off-topic: the article's title sounds like a fashion magazine headline.